Wiltshire Stainless Steel 4 Piece Children's Cutlery Set Puppy Design 18/10. The Kid's Puppy Cutlery Set includes a Fork, Knife, Small Spoon, Large Spoon. Perfectly sized for kids. Care: Dishwasher Safe, 5 Years Warranty. 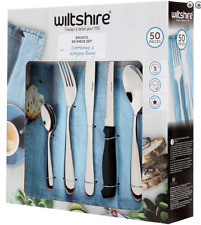 NEW Wiltshire Baguette Bronte 50 Piece Stainless Steel Classic Cutlery Set 50588. Features 50 Piece Cutlery Set High Quality 18/0 Stainless Steel Strong. We are not responsible for these changes if there is a mistake entered by you. Wiltshire Harmony 24 Piece Quality Stainless Steel Cutlery Set. This 24 pieces of high quality stainless steel cutlery is perfect to serve your guests with. With 4 pieces a set and complete for 6 guests, you can manage the biggest party with flare using these cutlery sets. This sale is for 6 wiltshire stainless steel splayds buffet forks in excellent condition 17.8cm long no box either only used once or never used. All china and glass wrapped in bubble wrap. 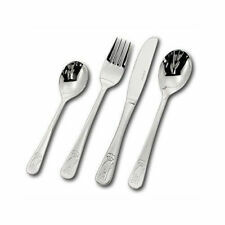 The Harmony range of cutlery from Wiltshire brings simple elegance to the dinner table for an affordable price. The Wiltshire Harmony 24 Piece Cutlery Set perfectly completes your kitchen utensil drawer, making it perfect for when extra guests drop by unexpectedly. Trending at AU $39.50eBay determines this price through a machine-learned model of the product's sale prices within the last 90 days. UP FOR SALE IS A LOVELY RETRO CUTLERY SET MADE BY WILTSHIRE IN STAINLESS STEEL WITH PATTERNED ENDS. THERE ARE 56 PIECES AND IT IS A SET FOR EIGHT PEOPLE. WILTSHIRE - A CUT ABOVE THE REST. 1 x Cook's Knife. Each knife feature triple rivet handles for a secure grip. 1 x Paring Knife. 1 x Utility Knife. 1 x Carving Knife. 1 x Bread Knife. Sharp fine edge blade. All china and glass wrapped in bubble wrap. A 66 piece, 12 person setting with accessories classic design cutlery set. 1 salad serving spoon. 1 salad serving fork. (Unless otherwise arranged). Quality 18/0 stainless steel. Bought a couple of years ago. 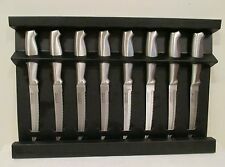 Set of 6 Wiltshire Retro Buffet Forks (Splades / Sporks) in Original Box. Buffet forks have not been used and are in excellent condition with no tarnishing. 3.4cm across at widest part of spoon. Box has slight wear from storage with one small tear to insert and another to outer box as pictured. Pattern Stoneleigh. 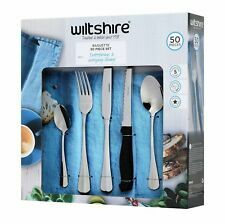 Wiltshire cutlery set. 1 Serving Spoon. 6 Table Knives. 6 Table forks. Still in original box. Never been used. 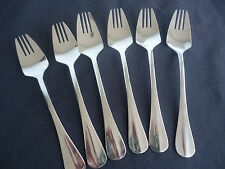 This sale is for 6 wiltshire stainless steel dessert sweet spoons cutlery in good condition nice larger size 16.5cm long. All china and glass wrapped in bubble wrap. WILTSHIRE - A CUT ABOVE THE REST. This block set is a clever kit that makes doing two (or more) things at once, easy. The knives are made from high quality stainless steel with contoured full stainless steel handles for strength, comfort and durability. This is a Wiltshire 12 piece knife block set. Cook's knife (ideal for chopping, dicing & mincing. Triple Rivet handles for strength. Paring knife (idea for peeling and cutting small fruits and vegetables). ). WILTSHIRE - A CUT ABOVE THE REST. The Wiltshire Classic Knife Block 6 Piece Set is an essential set that gives you the complete selection of knives to suit any cutting task. The knives are made from high quality stainless steel for good sharpness and the handles use a triple rivet construction for durability. THEY ARE IN GOOD USED CONDITION SHOWING THE USUAL WEAR AND USAGE SIGNS. Lovely boxed set of spoons and butter knife for afternoon tea and scones. Appear to have barely been used if at all. Excellent condition with some imperfections to the box. Wiltshire stay sharp knives have been designed with the latest technology and materials. The scabbard (the part that is used the sha r pen the knife ) is very easy to use and keep clean. Wiltshire Stay Sharp 13c m Utility knife is the perfect choice for peeling and cutting small fruits and vegetables. Unused, and in excellent condition. This Wiltshire Stay Sharp cook's knife is ideal for chopping, dicing and mincing. The Stay Sharp collection of knives have been developed to suit all kitchen tasks; from peeling to chopping and carving. All china and glass wrapped in bubble wrap. Can collect from Banora point near Tweed Heads. It will sharpen your knife so easy and quickly. Well established in kitchenware and household products, it has been synonymous with quality, reliability and value-for-money for over 65 years. Knife sharpener will sharpen the blade of all fine edge knives. BOX - Height 28cm, Width 18cm, Depth 3cm. FORK - Height 17cm, Width 3.5cm, Depth 2cm. Fantastic condition. 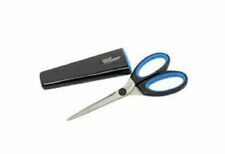 Wiltshire StaySharp Paring knife is idealfor cutting small fruits and vegetables. Collection: StaySharp. This Wiltshire Stay Sharp Paring knife is the perfect choice for peeling and cutting small fruits and vegetables. Trending at AU $16.86eBay determines this price through a machine-learned model of the product's sale prices within the last 90 days. This 8-piece steak knife set from Wiltshire is very classy. Constructed with high quality 18/10 stainless steel and a serrated blade, these knives are comfortable, stylish and highly functional. Dishwasher safe, the set will be a perfect addition to the any kitchen. 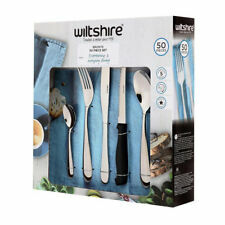 O Content/s: 1 x Wiltshire 50Pc BRONTE CUTLERY SET. This Wiltshire cutlery set is a simple, classic design - there’s no need to over complicate such things. o Avoid abrasive cleaners and scouring pads as they will scratch the cutlery surface. The Stay Sharp collection of knives have been developed to suit all kitchen tasks; from peeling to chopping and carving. Wiltshire Stay Sharp carving knife. The knife itself features a sharp fine edge blade - for strength, and is constructed using high-quality stainless steel. Dishwasher safe. Quality stainless steel. Buy it Now. Special Savings! 100% Genuine! 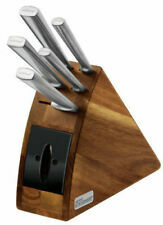 WILTSHIRE Trinity 6 Piece Knife Block Set! RRP $109.95!